Who hasn’t made these chewy little treats at least once (or 100) times in their lives? 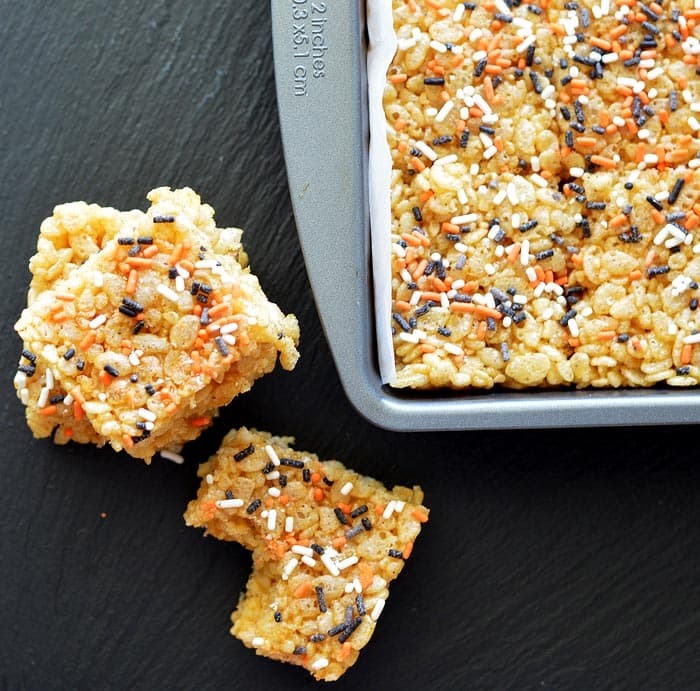 My childhood favorite gets a remake in our VEGAN Pumpkin Spice Rice Krispie Treats and involves three main substitutions. Vegan margarine, vegan marshmallows and vegan jimmies or sprinkles. As you know, most marshmallows are not vegan due to the gelatin used in making them. There are a handful of companies out there making the vegan version, such as Sweet and Sara or Dandies, which I used here today. There are recipes out there for making your own, but this quick and easy recipe isn’t meant to take all day. Who has time for all that? These marshmallows melted and tasted just like the original. Yay! Any time you adjust a recipe and/or veganize it, there are a few tips I like to offer you. First, for easy removal from the pan, use parchment paper. Seriously. Not optional. Also, these are slightly more moist than the ones I remember and that could be from the addition of pumpkin. But to keep that crisp in the cereal, I like to let the melted marshmallow mixture cool as much as possible while still allowing you to fold in the cereal. Otherwise, the hot mixture penetrates the cereal and well, you get rice “chewies”, not rice KRISPIES. Still delicious, just not what we are going for here. I am planning a tutorial for the holidays on creating your own vegan jimmies, but until then…I found these amazing vegan jimmies at Sweetopolita. They ship to the US and Canada. I honestly preferred these refrigerated. 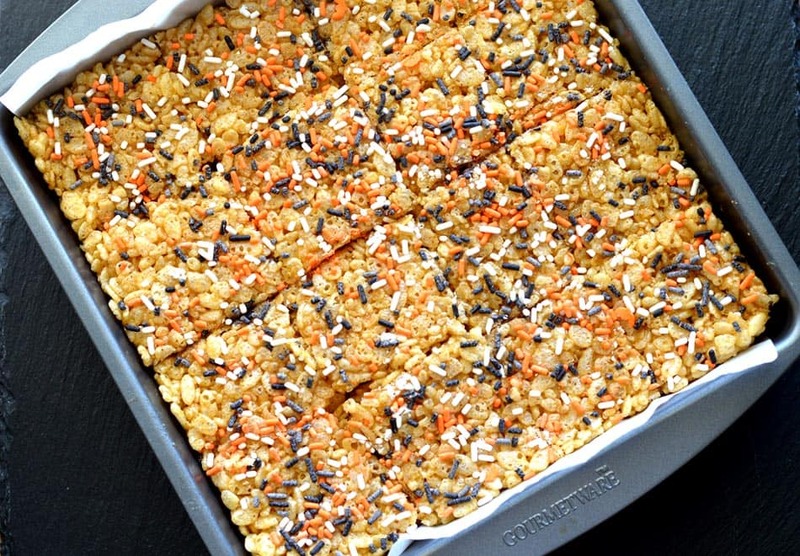 PERFECT texture and soooo yum! That pumpkin spice was amazingly delicious. It’s hard to eat just one. Oh, and I get asked a lot about pumpkin pie spice. If you don’t have it on hand, don’t worry. You likely have all of the ingredients to make your own. 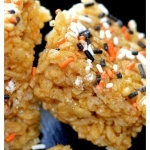 I make a double batch to use throughout the season. 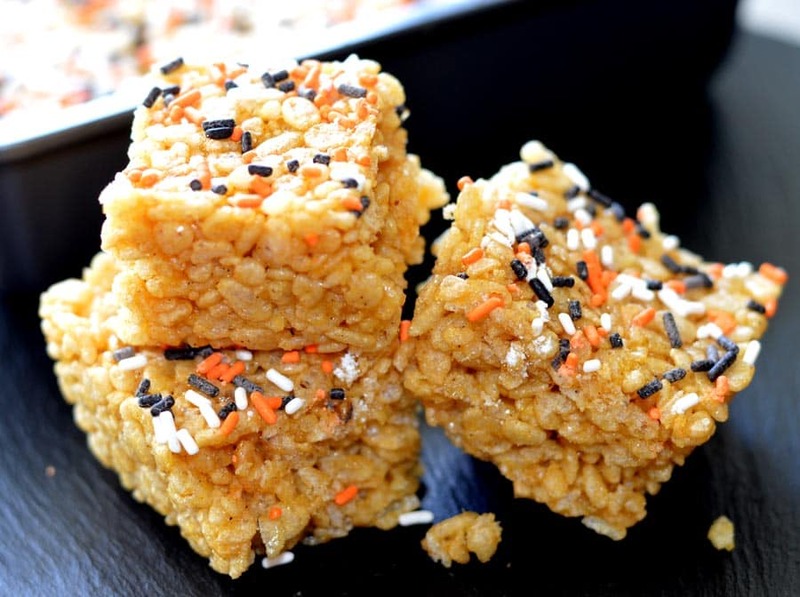 Did you make these VEGAN Pumpkin Spice Rice Krispie Treats? Take a pic and share it on Instagram with the hashtag #theveglife and tag@theveglife1. I would love to see it! Or, leave a comment below and let your fellow readers know what you thought. Your feedback often helps others decide whether or not to try my recipes. As always, I really appreciate your feedback ? Using a large, heavy-bottomed stock pot, melt vegan margarine over medium heat. While the margarine is melting, use a bit of margarine to grease an 8x8 or 9x9 baking pan and then line with parchment for ease of removal. Set aside. Once the margarine is melted, add the pumpkin and stir together. Add the marshmallows, stirring occasionally until melted. Remove from the heat. Now add the vanilla extract, pumpkin pie spice and salt. I like to let this mixture cool down a bit before adding the cereal because it tends to make them more chewy & like to retain that "crisp". If it gets too difficult to fold them in, just use the residual heat from the stove to slightly warm it again. The cooler the mixture can be before folding the cereal in, the better the end result. Using damp hands, press into the prepared baking pan. I used to always butter or spray my hands, but found the mixture still sticks. So I tried damp hands and it worked MUCH better. Press the mixture gently, but firmly into the pan. 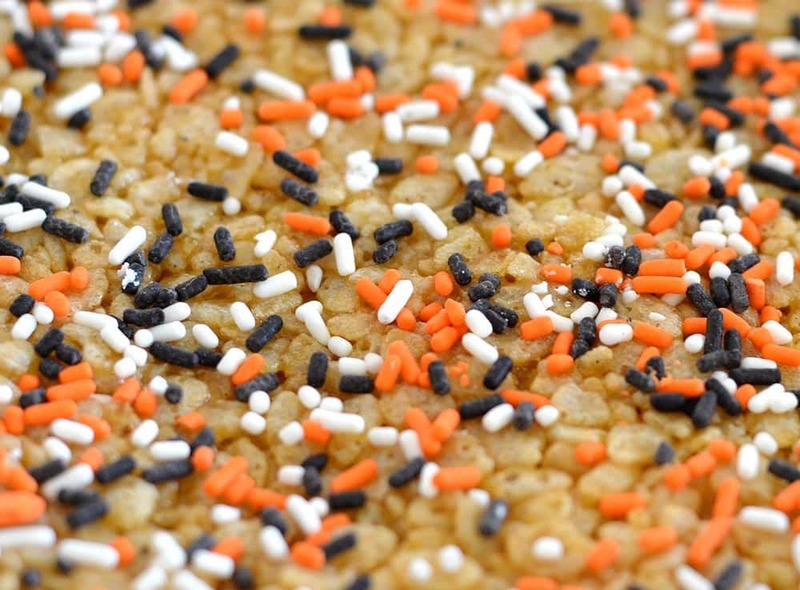 Immediately decorate with jimmies or sprinkles & lightly press them on. I like to refrigerate for at least an hour to set them before cutting so they retain their shape.